The Special Tree NeuroCare Campus of Romulus is the hub in a network of brain and spinal cord injury rehabilitation sites throughout Southeast Michigan. It has been privately owned since 1974, having begun as a long term care facility that advanced into a specialty niche of taking care of neurological traumatic injuries. Special Tree has services in the region including outpatient and residential locations, tailored to the needs of patients of all ages. The NeuroCare Campus is a 39 bed sub-acute facility that operates as a full medical post-acute care setting with 24 hour respiratory and nursing services. Offering physical therapy, occupational therapy, massage, speech, social work, and more; all care is coordinated through an internal case management team. Patients who stay here often have advanced medical needs, having been discharged here for rehabilitation, with daily living support significant. What makes Special Tree unique? Arriving at the facility, there is immediately a different look and feel. Nestled back in a stand of pine trees, the building sits in a beautiful natural landscape. The entry has a cafe, modern decor, a friendly reception station, upbeat music – everything greets the guest and provides for a comfortable setting. The area is active; bustling with patients, staff, and visitors. The facility includes an indoor pool, a lively green house, and gardens; all used for patient programs and therapy. It is clearly a place of energy and renewal. The environment mirrors the organizational philosophy, which emphasizes individual needs and promotes human dignity. Their “whole person” approach is seen in their mission statement and lived by their team. 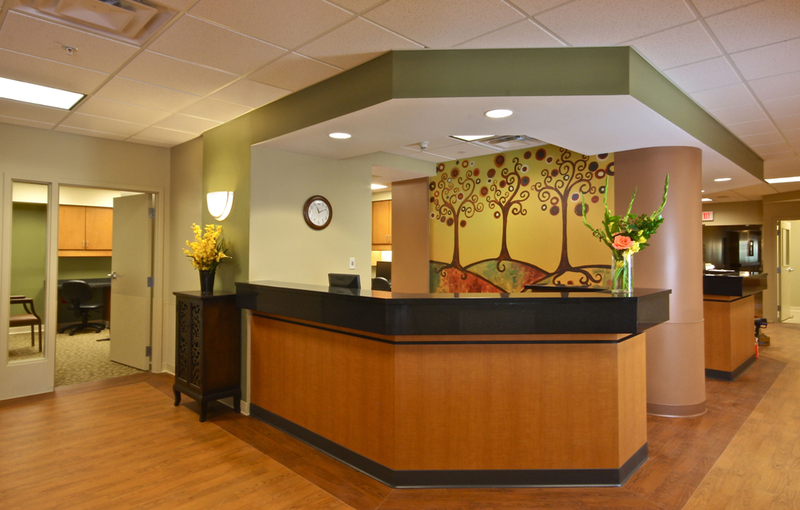 A neural care center is not a place where anyone would want to find themselves, but the team at Special Tree has made it a pleasant place regardless. The initial assessment begins by identifying what is important to the individual and the family; goals for treatment are established from there. Upon admission, patients are assigned a primary internal case manager who takes the case, understands the current needs and coordinates the interdisciplinary team. The team consists of the case manager, physician services, medical director, Physician Assistants, therapists as needed, and nursing staff. They look at each case individually; the goals and the plan of care, reviewing every piece of the puzzle. The journey to recovery is viewed holistically, with all steps toward the individual’s goals orchestrated. The team meets weekly, taking up each case and having a dynamic discussion, reviewing progress toward goals and collaborating on next steps. The team routinely meets with the patient and their support system, including family and any external case managers. All staff members at Special Tree are trained to be experts in brain and spinal care, including support services like dietary and office staff. It is a learning environment that attracts knowledge seekers. When bringing new team members on, they look for people who are subscribed to the whole person paradigm, who are passionate but may not know it yet. From that foundation they are able to build a caring team. Lela Hickonbottom is the Chief Nursing Officer for the organization. Her role is to identify, strengthen, and deliver comprehensive nursing care with her team. Having been there 12 years, she finds her work very rewarding. The job involves meeting someone at an inopportune time and helping them to reclaim their life. For Hickonbottom, the greatest reward is being a part of the patient’s recovery, helping their families redefine life, and guiding them through that journey. Also, it means seeing miracles every day. Want to learn more about Special Tree and their array of services? Visit www.specialtree.com. Have a specialty care based teamwork story to share? Email Stacie Longwell Hill at [email protected].